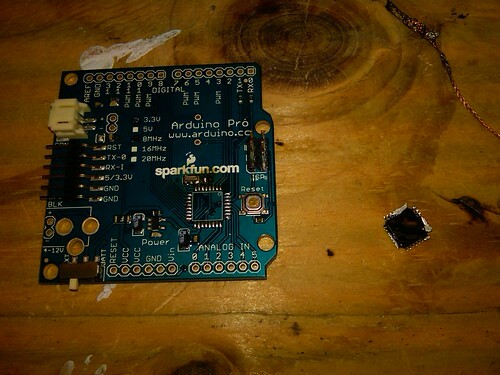 I bought one of the "ding & dent" items from Sparkfun and ended up with a non-functional Arduino Pro that has a 32PIN ATMega168 TQFP package chip on it. I want to salvage the MCU and I plan to use some ChipQuik to get it off then remount it on a Schmartboard to break it out. 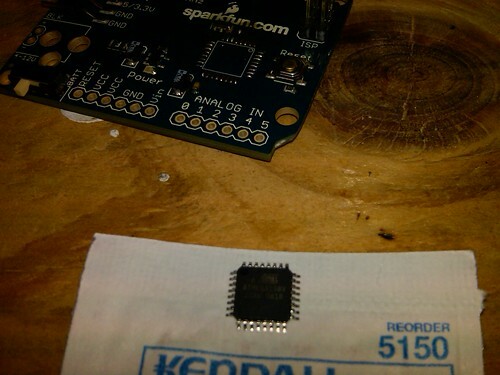 My question: I have an ISP (USBTiny clone) that I can use to program the chip. If I were to use a crystal other than 14.7456MHz or simply the internal oscillator, but I want to put say the LEDHeart code on the chip, can I just compile the code then put the hex file on the chip using the ISP and AVRDUDE? I know I'll have to make adjustments to the timing and such in the code if I'm using a different speed oscillator but I was just wondering if there would be any other issues. I don't see why there would be any problem with that. BTW, I've never tried using chipquick... have you used it before?? If so, how well did it work? I honestly haven't used it at all yet. Last night, I was trying to see what I could do with just an iron and some solder wick, but after just a little bit of trying I knew it was a good idea to stop and find a better way. SO, after a bunch of surfing around today, I've decided this method seems like the least destructive besides having a hot air rework station and/or a hot table. I'll have to let you know how it works out. I'm actually getting ready to try my hand at some smd soldering. I came across THIS project and thought it would be a good starting point -- not to mention drive my co-worker crazy. (Plan to plant it on his work pc on April 1st). He loves to type in caps only so this will be the perfect prank for him. I'll be interested to know how well that stuff works. So far my only method of removing parts quickly (and destructively) is by placing the board upside down in a vise and heating with a heat gun then giving it a quick rap with the handle of a screwdriver. It's amazing how many little parts fall off that way! :D Crude, but it works. That USB thingy is pretty funny. I need to make one of those sometime too! I went and bought some ChipQuick at my local electronics super-center and I will tell you it works great! It melted really quick and I sort of made a little ball of it then dragged it around the pins with my soldering iron, gently of course. As I came around on the last side of 8 pins, it just came loose from the minor pressure of my iron and I sort of was able to simply scoot the chip off the edge of the board and onto my work-bench. Then I simply used some braided wick to remove the little globs of leftover from the pins. 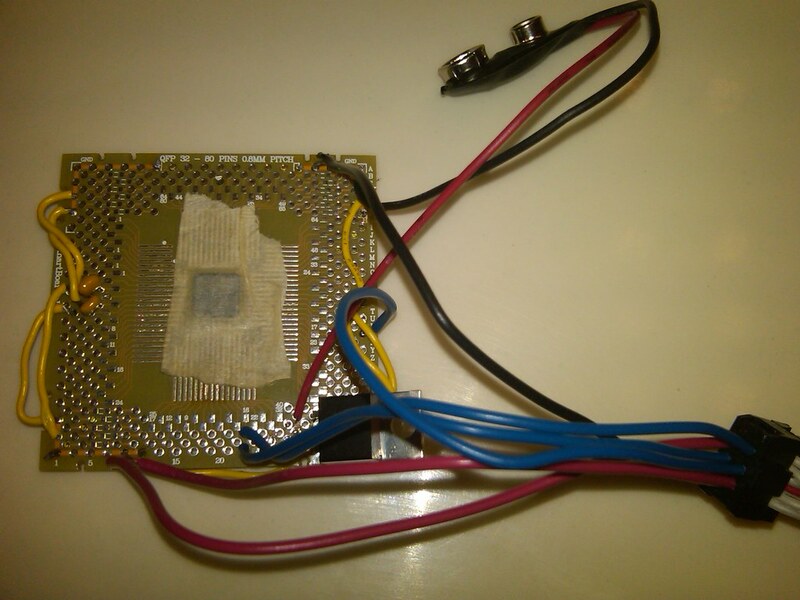 I tried to put it on a schmartboard today but my stupid piece of junk fixed temp soldering iron only goes to 700F and the solder built into the board requires 750-800F. So, I've got it held down right now with masking tape! I was going to throw some female headers on and wire everything up to see if it works, but at the moment I can't for the life of me find my X-acto knife, which I need to cut the headers apart. URGH! Let me know if you see it! Wow, that does look as though it worked real good. I've got a couple of old tivo boards that have attiny2313 micro controllers and real-time clock IC's on them. I've hesitated using the heat gun method on them. Based on your experience I may just have to get some ChipQuik and give it a shot. avrdude: error: programm enable: target doesn't answer. I really wanted this to be the brain of my wife's V-day present. I was planning to make a box with this hidden inside the lid and the LEDHeart project running 20 (maybe 40 if I can acomplish the code modifications) LEDs around the edge. So, I had to go ahead and order another one from DigiKey today, having it sent first class mail so hopefully it will arrive by the middle of next week, giving me time to complete the project before Feb 14. BTW, the SchmartBoard is really small, and fun to solder. I could see it being the basis for a "NerdKit Pro Kit" or something. :) In fact if anyone wants one, I'll get the parts and solder it up for you at a fair price! I think Fry's had about 4 of these left. ;-P I just really wish anyone (besides Singapore and Hong Kong eBayers which take 3 weeks to get) had the mega328 TQFPs in stock, anywhere! Forgot to mention, in the pic above the thicker blue, black, and red wires are meant to be temporary just for ISP programming. They are very lightly tacked into their holes using the 22GA solid wire from the nerdkit. They will be removed after programming of course. The yellow wire is 24GA stranded. The next one I put together I might have to try standard green wire (wire wrap).